We had a very productive weekend. Carter helped me accomplish a slew of small tasks, which mainly involved hanging things on our walls. After 1+ years of being in the house, we still mostly have blank walls so every room feels unfinished. My goal this weekend was to start to remedy that. 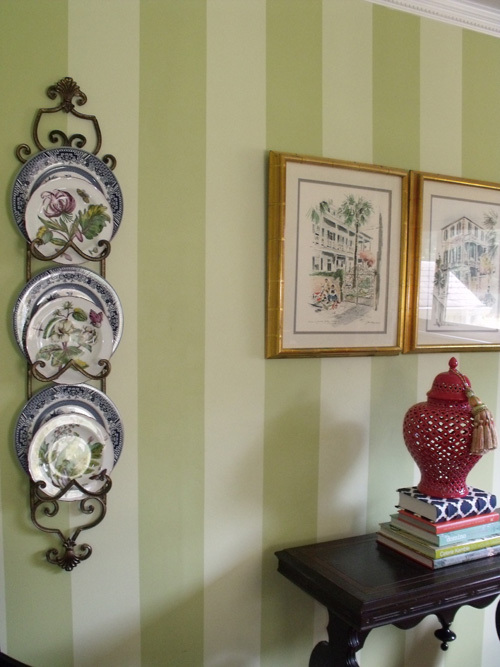 One task on our list was to finally hang my plate rack in the dining room. This plate rack used to hold our wedding china in our last place, but I now have my wedding china stacked on our bar cart, so I picked up some informal plates to display (that I can also now circle in/out with my wedding china to create different looks). I found a set of four blue and white porcelain dinner plates at HomeGoods. They were inexpensive and decorated in a pagoda theme, so they were perfect for the space (the centerpiece of my dining table is an oversized, blue/white ginger jar and the seats of my two head chairs are upholstered in blue/white pagoda fabric). On a trip to Lucketts a while back, I found the most beautiful set of floral dessert plates in shades of green, chartreuse, lavender, plum and white - the exact shades of my dining room. My original thought was actually to put the blue and white plates on one rack, and the dessert plates on their own separate rack, but then I thought - why not combine them? You can't really see the pagodas on the blue/white set of plates, but I like that the geometric pattern of these plates frames the dessert plates so well. It took us all of five minutes to get the plate rack up, but it was just one of those things that hadn't made it to the top of our list for months. And now, the room feels almost complete (just need to hem some curtains). 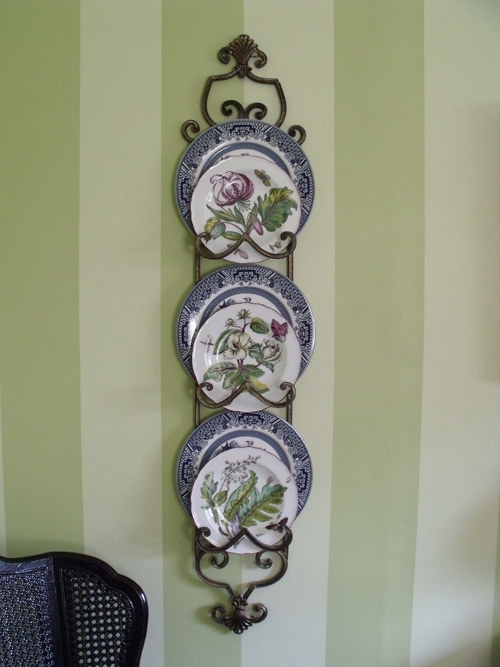 The little plate rack project also reminded me of my love for mismatched china. I love contrasting patterns used together in almost anything, but especially plates. It gives your table an interesting, layered look. 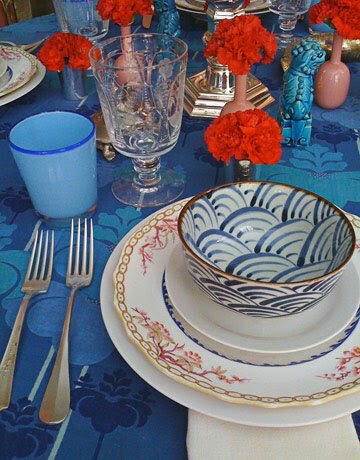 Granted, I also love a full set of immaculately matched china, but mixing it up is always beautiful. The plates look really good...and I love those prints to! Amazing what completing small tasks can do for a room (and your sense of accomplishment!). Love the plate rack and how you layered the plates.